It’s the final weekend of Bedfordshire League action in 2015 before a mini break - action then resumes on Saturday, January 9. That is apart from the Premier Division supported by Sportsform fixture on January 2 between AFC Oakley M&DH and Sandy. With us having just reached the half-way point of the campaign the quest for the Premier Division supported by Sportsform title looks even at this stage to be down to a challenge between just six clubs and of those clubs four go head to head this weekend. hilst at Renhold Playing Fields, third place Renhold United whose home form of late has seen them collect just four points from the last nine on offer play hosts to second place Ampthill Town Reserves who are still unbeaten on the road this season and currently on a 12 game unbeaten league run. The other two clubs making up the half-dozen are headed by the current league leaders and perhaps title favourites AFC Oakley M&DH who make tracks still unbeaten on the road this season to face Shefford Town & Campton at their Hitchin Road base where they have secured home wins over Flitwick Town & Kempston Town & Bedford College during the last 14 days. For fourth place AFC Kempston Town & Bedford College themselves it’s home action at Hillgrounds against ninth place Marston Shelton Rovers side whose away form of late suggests the Town will start firm favorites to collect all three points and end a three game losing run. Down at the other end of the table the big game comes at Bedford Road Recreation Ground where 13th place Sandy, now on a six game losing run, welcoem second from bottom of the table Eastcotts AFC whose six outings to date on the road have all ended in defeat. Whilst at Lodge Road 11th place hosts Sharnbrook have won just the twice all season and the visitors are third from bottom of the table Caldecote whose only wins on the road this season were achieved at the bottom two clubs namely Eastcotts AFC and Elstow Abbey. The final game in this division will see 12th place Pavenham who are still in need of the points to stay clear of the drop zone playing hosts at their Playing Field headquarters to seventh place Cranfield United whose nine away outings to date have brought about just three victories. 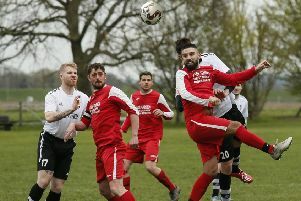 In Division One supported by Wests Citroen Bedford action for the league leaders Sundon Park Rangers who still hold down a seasons unbeaten record the visitors to face them at Stockwood Park Athletic Track are fifth place Meltis Albion. Whilst with second place Stevington sitting the afternoon out the Rangers nearest other two challengers for the league title both enjoy home advantage. At Hillgrounds on the 3G surface where fourth place hosts AFC Kempston Town & Bedford College Reserves have been beaten just the twice this season the visitors are tenth place Shefford Town & Campton Reserves who will hit the road in search of just their second away win of the season . Whilst for third place Ickleford at their Chambers Lane base where they still remain unbeaten this season the visitors are sixth place Queens Park Crescents who like Shefford Town & Campton Reserves will hit the road in search of just their second away win of the season. Elsewhere it’s local derby action at Groveside for second from bottom of the table hosts Henlow who with with just one home win to their name this season are called upon by fellow strugglers Potton Town who sit above them in the league standings on goal difference only for what is commonly known as a six pointer encounter. Which is exactly how you would also describe the clash at Church Lane between the hosting bottom of the table AFC Oakley M&DH Reserves who are yet to win on home soil this season and the visiting eighth place Houghton Athletic who are yet to win on the road this season. The final action in this division comes at Gold Street where ninth place Riseley Sports look for just their third home win of the season against seventh place Westoning who have to date won just the twice on the road this season. In Division Two the game of the day takes place at Pirton Recreation Ground where second place Lea Sports PSG host the still 100% away from home and unbeaten league leaders Cranfield United Reserves. Whilst for fellow title challengers and third place Cople & Bedford SA who are currently on a four game winning run it’s a trip to Wootton Recreation Ground to be hosted by ninth place Wootton Village who will be looking to take their unbeaten home ways up to three games. Elsewhere, over in Jubilee Park sixth place Atletico Europa face a visit from second from bottom of the table Kempston Athletic who have seen their last five trips away from their Cutler Hammer base all end in defeat and talking of Cutler Hammer that will be the venue at which eighth place Bedford United head to be hosted by seventh place Kempston Hammers Sports who will in search of just their second home win of the season. The final action in this division comes at the Football Centre being the venue at which fifth place hosts Flitwick Town Reserves look for their fourth home win on the bounce when they welcome bottom of the table Marston Shelton Rovers Reserves who are yet to win on the road this season. Division Three action will see the league leaders Wixams looking to resume winning ways to maintain their seasons 100% home record when they play hosts to eighth place Dinamo Flitwick. Whilst it’s the same quest of returning to winning ways for second place Sundon Park Rovers who look to maintain their unbeaten away record with a trip into Mowsbury Park to be hosted by third place White Eagles whom last weekend beat them 1-0 on their visit to Luton. Meantime over at Horseshoes Close it’s local derby action for the hosting fourth place AFC Dunton has they look for their third home win on the bounce when called upon by third from bottom of the table Sandy Reserves who have failed to win on the road in seven attempts since their opening away fixture of the season. Whilst at Harvey Close sixth place hosts Caldecote Reserves will be looking for home win number five on the bounce when called upon by seventh place Renhold United Reserves who have won just the once on the road all season. Other action comes at Miller Road where the bottom two sides clash. Bottom side Meltis Albion Reserves who are still without a home win to their name this season take on a Clifton side whose only away win of the season to date came at Sandy Reserves way back in mid-September. The final action in this division taking place at Rectory Road where ninth place Shefford Town & Campton A look to ensure they don’t suffer home defeat number three on the bounce when called upon by fifth place Wilstead Reserves who will hit the road looking for win number three on the bounce. Perhaps the highlight of the restricted programme of just three games in Division Four could come at Hurst Grove being the venue at which bottom of the table Lidlington United Sports who are still in search of their first points of the season play hosts to the team immediately above them in the standings namely Henlow Reserves who themselves have won just the once this season. Or if you prefer your action at the other end of the table, at their Sandy Academy base the still 100% league leaders Mid Beds Tigers receive a visit from third place Bedford Albion who are currently on a seven game winning run and will perhaps prove to be the Tigers sternest test of the season to date. The final action being due at Greenfield Road being where seventh place hosts Westoning Reserves who have lost their last three home games are visited by sixth place AFC Kempston Town & Bedford College A.